Daryn and I have started on a new megawad project. We are planning on it being another base. It will be one fairly similar to our 'Dragon Sector' Project. 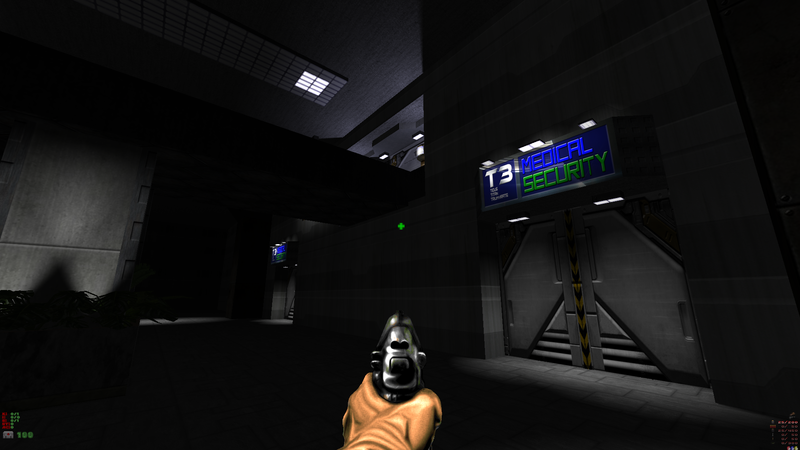 The premise for this mapset will be that the UAC had competition. The Tidus Corporation. While the UAC set up bases on Mars and Ganymede (the latter of these where Dragon Sector took place), The Tidus Corporation endeavored to set one up on Titan, Saturn's largest moon. 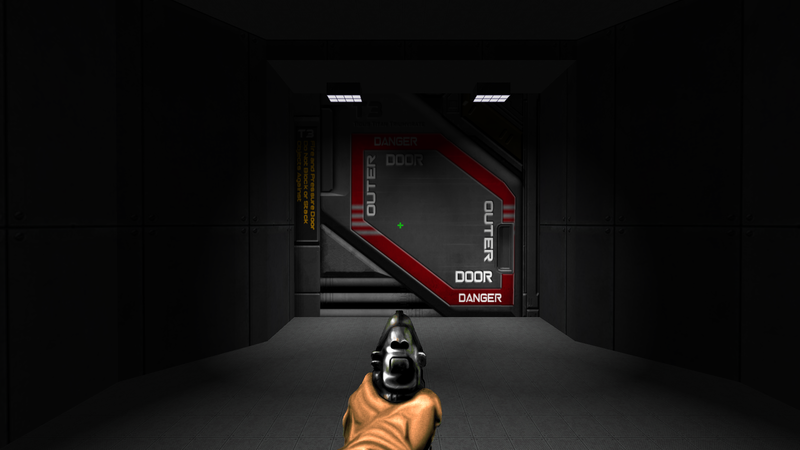 There'll be a lot of reoccurring textures from Doom2. 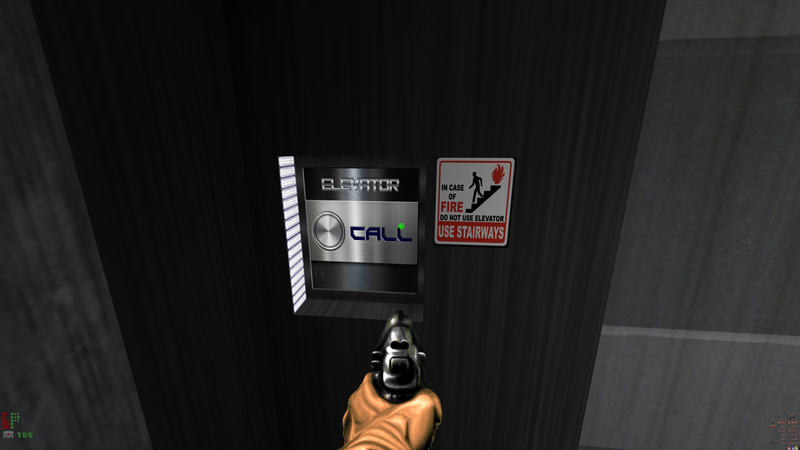 The premise being is that the UAC and Tidus used many of the same contractors for construction. 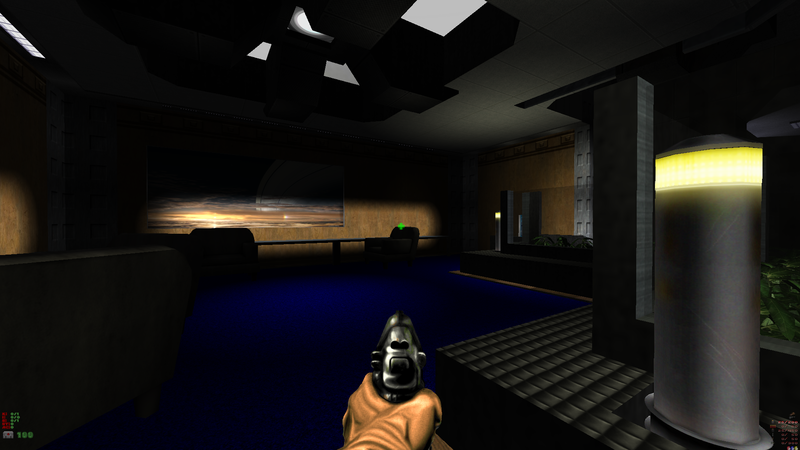 A few recycled textures, though, is where any similarities will end. The most notable of the differences is that all doors will be sliding doors. All of them. Yeah, crap tons of work, that, but damn, is it ever so turning out to be worth it. We've mixed new sound sequences for the doors, too, and do they ever sound futuristic sci-fi to the max badass! 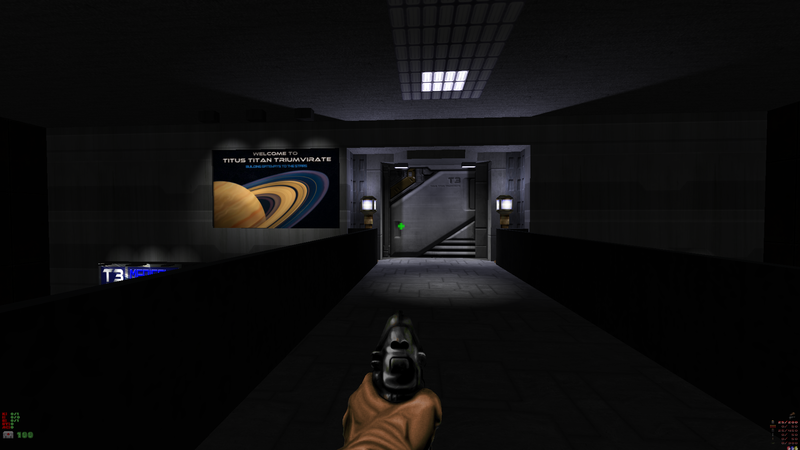 The next most notable thing will be tons of all new textures. Hi-res ones, too. Yeah, I'm the map-maker who goes for the atmospheric experience. When you're playing my maps, you know you're in a base, and what parts of it you're in! We've been at it for about a month now. So far we've come up with some very impressive stuff. To give a bit of a teaser, I've attached some screenshots. Also, we could probably use another member on our team. We're looking for somebody who knows how to get good play balance going and how to set up the different skill levels so they give good challenges to players of varying skills. If interested, just drop a reply to us in this thread. This plans to be a long term project. We hope to make something that folks will really remember. 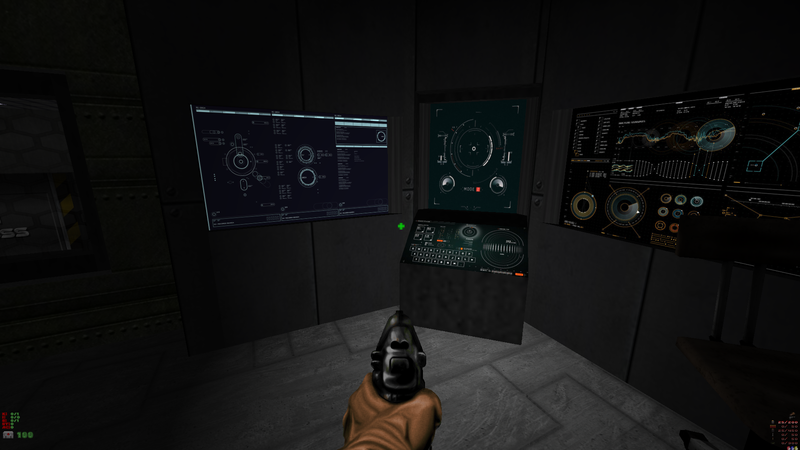 Looks pretty cool, gives me systemshock 2 vibes. 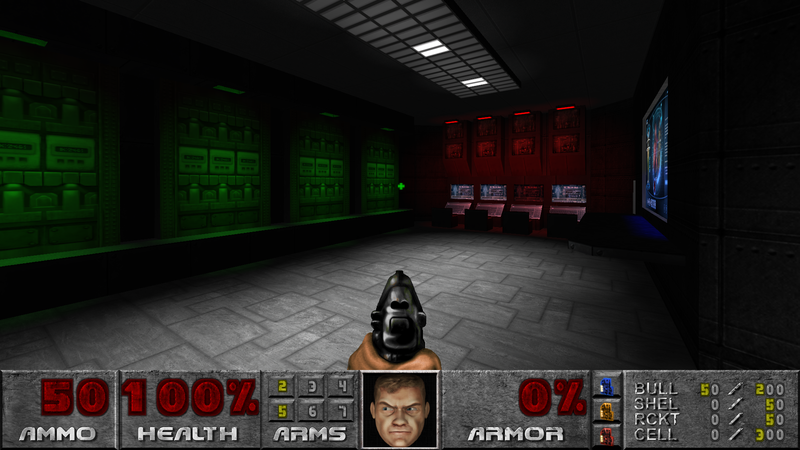 Also the 3D doomguy portrait, although a pretty cool feature, is a little uncanny and unsettling for some reason. Good luck on the project, hope you guys manage to see it all the way through. Yeah, heh, well, I'm a way old school Doomer. 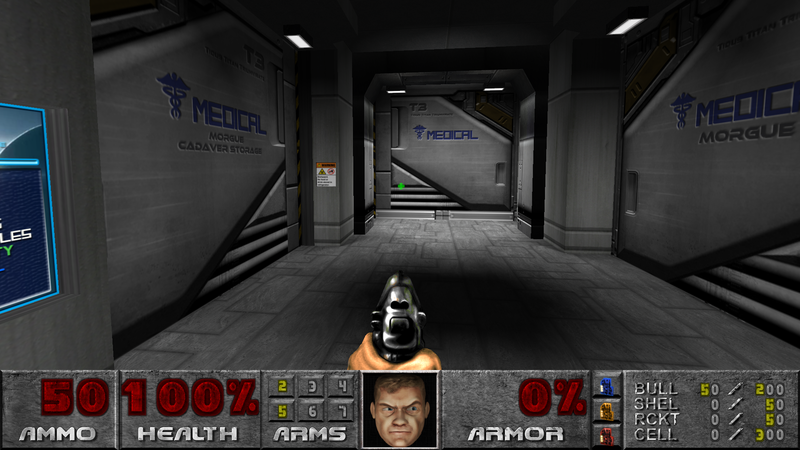 Those newfangled huds that just show health, armor and ammo in little icons and such, just always seemed too else-Doom for me. 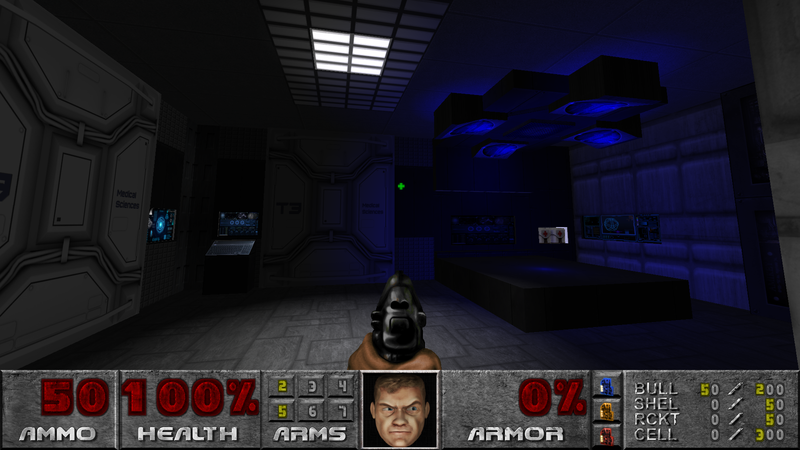 And here I am saying 'Else-Doom' when I'm making maps that are else-Doom! Hee! I just always liked that old-school status bar. 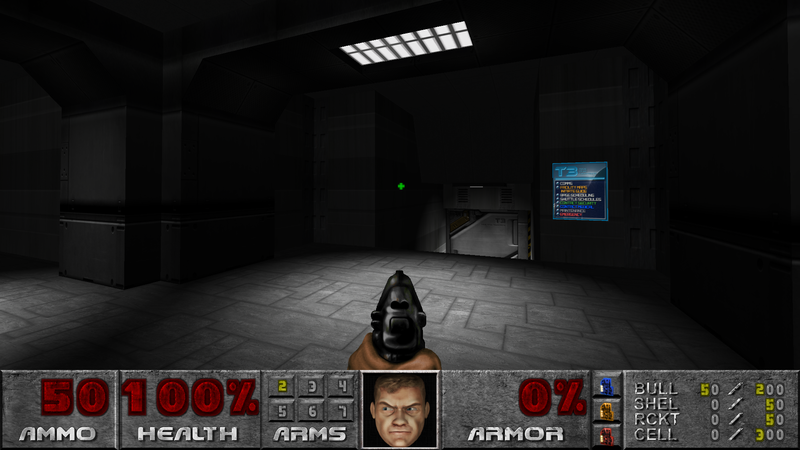 It was there when I first started playing Doom, yep, back in 93, so it's always gotta be there, and scaled to fit the whole bottom of the screen, or it just isn't playing Doom for me! 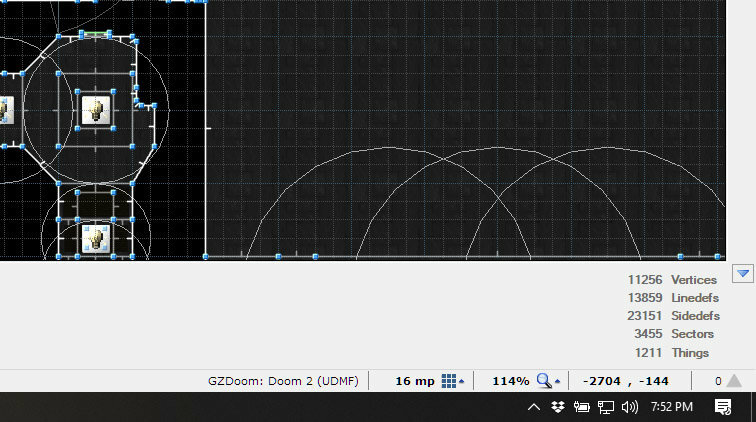 Oh and I forgot to mention, we are building this in GZDoomBuilder - UDMF format. 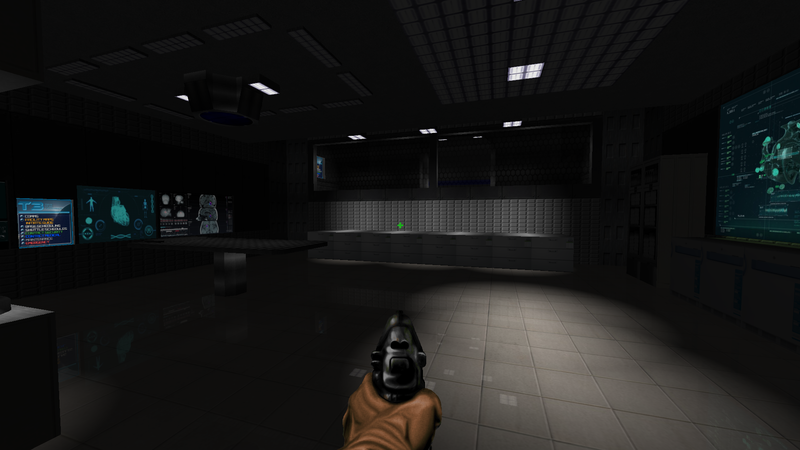 We are making the map to work in either GZDoom or Zandronum. Gameplay will be mostly focused on the single-player experience, however. We are designing it to work well in 'Cooperative' play, also. Deathmatch might be a bit of a tossup. I prefer to focus mostly on atmosphere and story. The maps will be able to be played in deathmatch, but they may leave some lacking for a good experience with it. Some more screenshots. Progress is being rapidly made! Okay, we're humming right along. However, the map is starting to become complex enough, that I am starting to worry about maximums. Look to the lower right. It's listing the numbers of things, sidedefs, etc I have in the map so far. Is there a ceiling I need to be worried about? Someone in the know please let me know. The limit you'll realistically run into are the number of sidedefs. 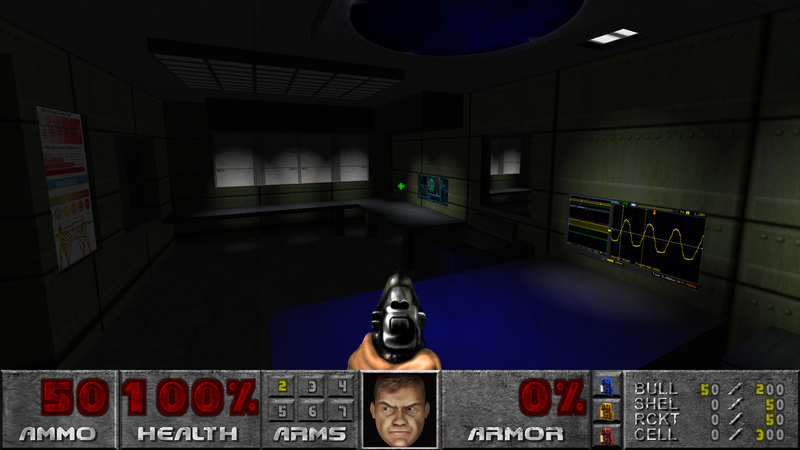 You can have 65536 unique sidedefs (at least when playing the map in an limit removing engine), so you are still far off of that. Thanks to sidedef compression you can go beyond that limitation. The DB2 family editors will automatically compress sidedefs as needed. Looks pretty cool. 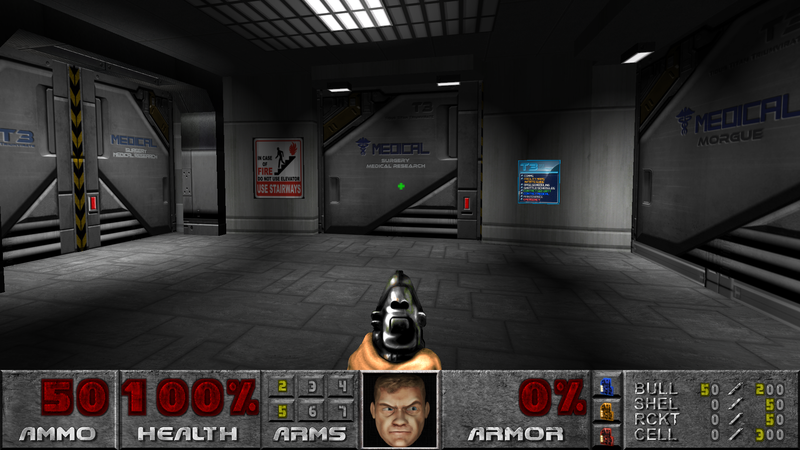 I do love that HUD. 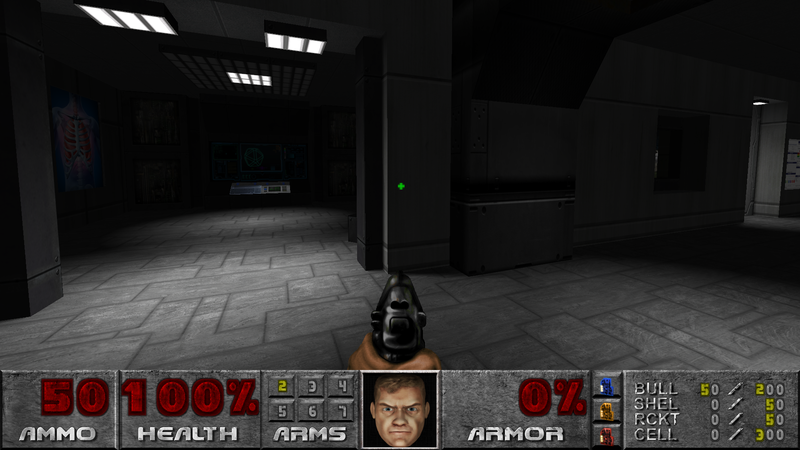 That's a HD version of the DOOM HUD. It was on the ModDB. 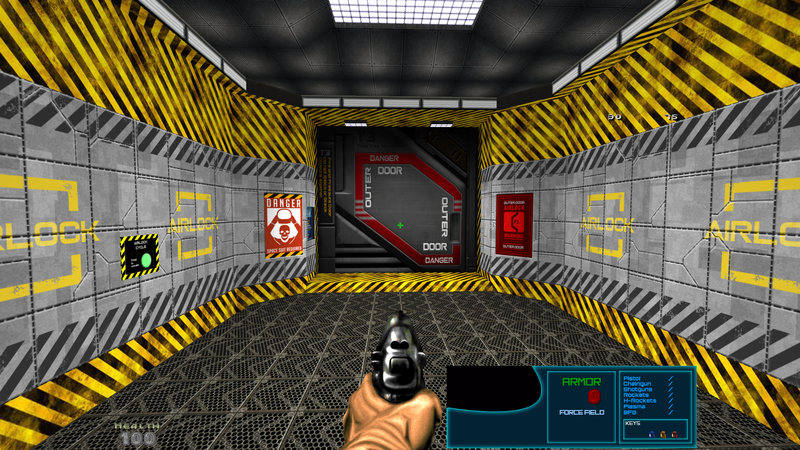 We're actually working on a more thematically fitting HUD for this, now that I got my head around SBARINFO. @Barefootstallion Is the WAD going to include those hi-res textures, or is it a separate thing you're using on your end? They'll be included. 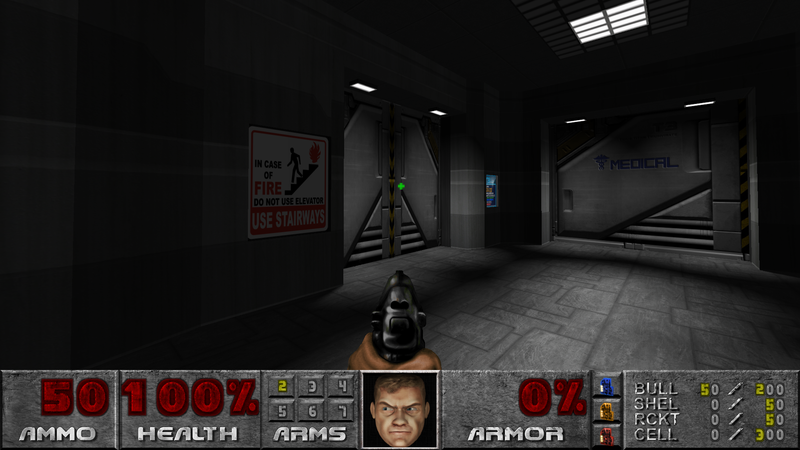 The Hi-Res Doom textures themselves can be found on moddb, but the rest of them will be included in the pk3. Not in the wad, exactly. They'll be in pk3 files. But yes, they'll be included. And we have the coolest airlock evar! This is the alt fire for the plasma rifle. It is still very much a WIP, especially with the muzzle animation and the like, but it at least gives you an idea of what it does. 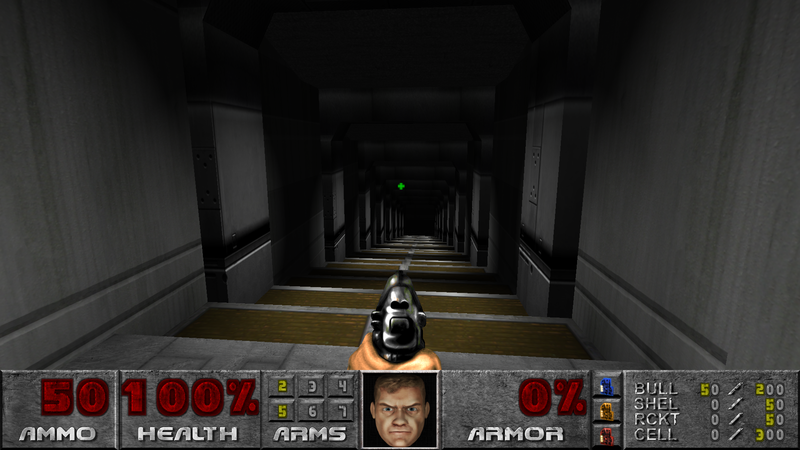 On a related note, it will kill the cyberdemon with two shots. This project is providing me with a lot of chalenges. I've never done scripting stuff like this before, but it seems like I'm taking to it quite well. I have to wonder though, does anyone else ever feel like the more you learn about something, the less you feel you know? That's what I've got going on. I've also discovered that if I go back and look at the early code I did, I end up refactoring it. Quick question for anyone with ZScript experience: Can you do Delay commands in there? 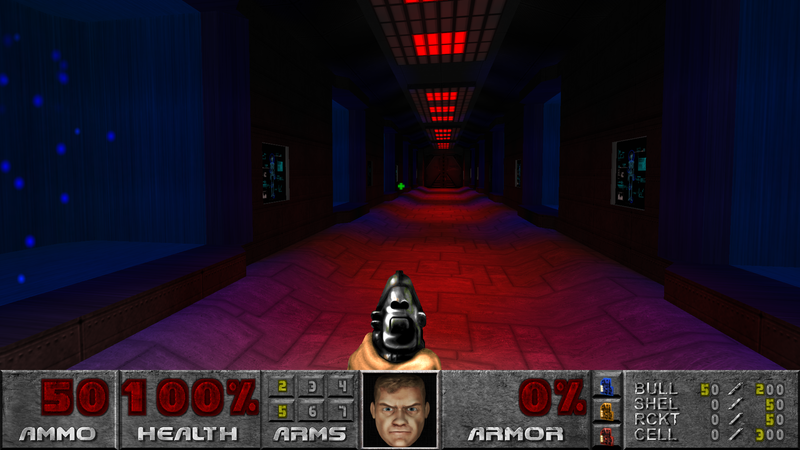 I tried but GZDoom wasn't happy with it. Provide an example of what you are trying to achieve (or explain more widely). Basically, AFAIK, you need to override a Tick() function for you class (pretty much like you'd do this in C++), create class-based variables, and decrease/increase them in Tick() (every tick is 1/35 of a second). And into other functions you should put the code to check for those variables (or reset them), and make something happen when their values has changed from the "delay value" to zero (that will mean the timer has expired). In A Few Words: Use Tick() func to count portions of time (via a variables), use other functions to check for those variables and make something when the requirements are met. Of course, those vars should be internal & private for the class. well, it looks wonderful! i hope that weapons and monsters animation will be smooth too! the more you learn about something, the less you feel you know? Heh, we're going to make things as smooth and as realistic as possible. However, while I wish I was, I am no artist. 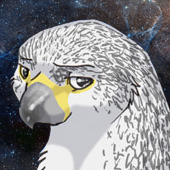 I can make great maps, do some pretty cool stuff in Photoshop, but I couldn't draw anything to save my life! But we're trying. We've got a load of custom and remade weapons. We're putting alternate fire on all the weapons. We have a thrown grenade. And... we're doing away with the BFG, and are replacing it with a drone. The drone is interesting. It'll be a pickup-able item, collected as ammo, but when you release it, it goes and fights for you. It's powerful enough, too, to be a hail mary weapon. Two of them fighting in concert can often defeat the cyberdemon. Not easily, though. Three of them will slaughter it. 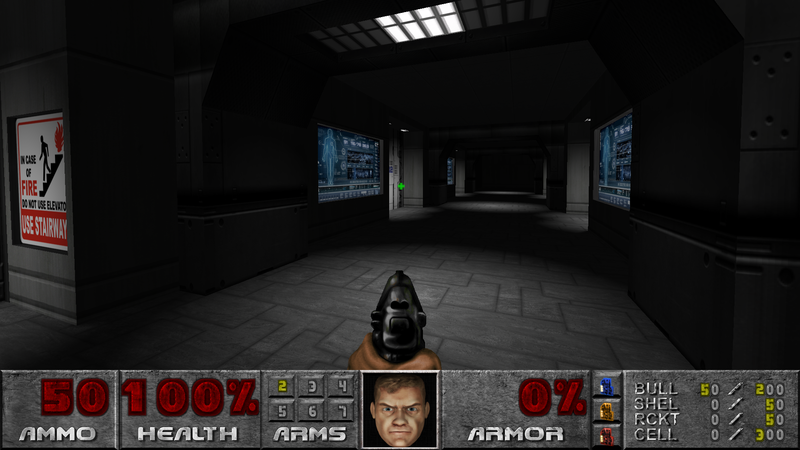 But sometimes the cyberdemon will prevail against two. The drone looks like a quad-copter, except with small jets instead of rotors. Also, we have collected 17 monsters from the 667 archive. 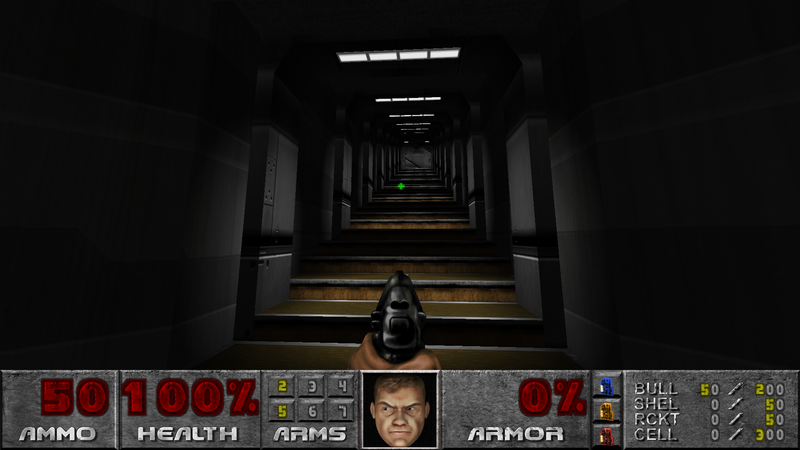 We're remaking most of them, though, so those experienced Doomers in our community will be in for a bit of a surprise. 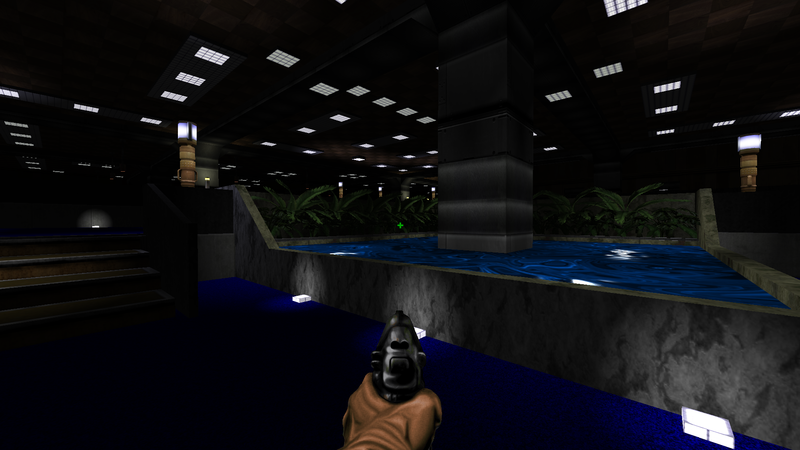 We're also going to experiment with a Hexen-like mapset. 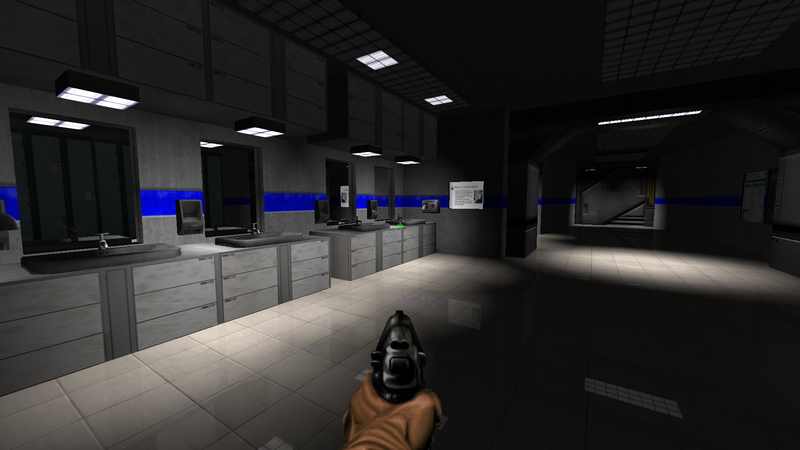 You'll have to traverse back and forth across the maps to solve complex puzzles. We're putting a great deal of thought into it, too, so it ought to be a very satisfying experience. But it's still a work in progress. It'll probably be several months before we have anything to release. But it'll be something to look forward to. We're certainly working to make these maps memorable. wow seems an incredible and wonderful job , make me think about the stronghold mapset but with a consecutive story more than a select your mission from a base . in later time why don't you think to implement a sort of "horde mode" too ? i think it could be really fun!! Horde mode? What is this? I must know!